National Sustainable Agriculture Coalition It's Time for a Better Food & Farm Bill. 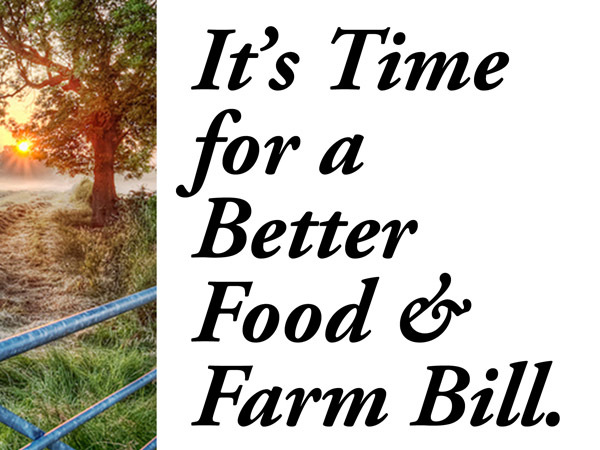 It's Time for a Better Food & Farm Bill. Congress is hard at work writing the 2012 Farm Bill. The National Sustainable Agriculture Coalition's comprehensive 2012 Farm Bill policy platform, Farming for the Future: A Sustainable Agriculture Agenda for the 2012 Food & Farm Bill, reflects the real, urgent needs of farmers, ranchers, and food entrepreneurs across the country. We need your help! Let's show Congress that people from around the country - from farmers to families, from Montana to Mississippi - are calling for change. Sign on as a citizen endorser of Farming for the Future! Why do YOU care about a better farm bill? 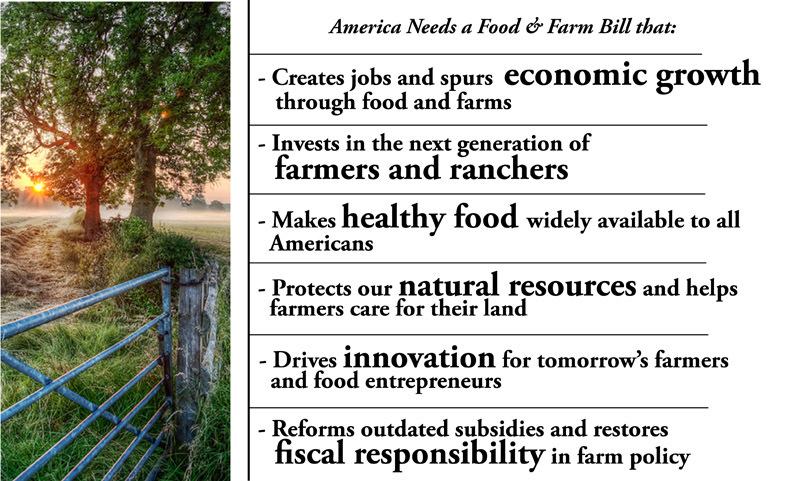 The 2012 Farm Bill should create jobs and spur economic growth through food and farms. Local and regional agriculture is a major driver in the farm economy. Let’s develop policies that create economic opportunities through local and regional markets; improve processing and distribution infrastructure for local and regional agriculture; and invest in training, technical assistance, and microcredit for rural entrepreneurs that will enable small business development and revitalize rural areas. The 2012 Farm Bill should invest in the next generation of farmers and ranchers. Agriculture is a growing sector of our nation’s economy, yet barriers make farming and ranching one of the hardest careers to pursue. We need policies that enable beginning and socially disadvantaged producers to access land, credit, and crop insurance; to launch and strengthen new farm businesses; and to receive appropriate training and mentoring; this will ensure that more people can start to farm and that the nation’s food supply remains viable. The 2012 Farm Bill should protect our natural resources and help farmers care for their land. As stewards of forty percent of the landmass in the United States, American farmers and ranchers are important managers of our natural resources. We should fund and strengthen working lands conservation programs that help producers protect and rebuild soil, improve water and air quality, and reverse habitat loss while maintaining productive farms and ranches. Ensuring that producers avoid environmentally harmful practices when they receive crop insurance subsidies will modernize the farm safety net and protect the productivity of agricultural lands. The 2012 Farm Bill should drive innovation for tomorrow’s farmers and food entrepreneurs. Agricultural research is important for continued productivity and innovation across diverse and expanding sectors of American agriculture – we need policy that funds and strengthens successful programs for sustainable agriculture, organic farming systems, and specialty crops; addresses new research and data collection needs; and improves coordination on essential public plant and animal breeding efforts. The 2012 Farm Bill should make healthy food widely available to all Americans. Let’s expand access to healthy food for consumers, including underserved communities, by connecting local and regional farmers with schools and communities with fresh food. Policies should enable participants in food assistance programs to shop at farmers’ markets; bolster the amount of locally produced foods available in schools; and invest in community-led solutions to improving food access and quality. The 2012 Farm Bill should reform outdated subsidies and restore fiscal responsibility in farm policy. Reforms that restore common-sense rules to farm programs and crop insurance will help build the next generation of family farmers and will eliminate wasteful spending in agriculture. While farm programs are capped by law, huge loopholes mean that unlimited subsidies go to mega-farms. We need to close current loopholes and target payments to active farmers instead of absentee landowners and investment bankers.